Some people say a picture is worth a thousand words. My friend Suzanne happens to be pretty skilled at taking photos so I reckon hers are worth even more. I’d love to share some of the photos she has taken of Benin. Some of are Cotonou, where our ship is docked, and others are from surrounding areas. I hope you enjoy them as much as I do. Blog post coming soon, I promise. The sunrise view from the bow of the M/V Africa Mercy, facing east. Cotonou, Benin. The entrance to the port. Deck 7 starboard side. It took me over a year to learn the difference between “bow” and “stern” and “port side” and “starboard side.” Well, okay. I knew the words but they didn’t seem to stop me from getting turned around. It wouldn’t truly be a sunrise without a cup of coffee, would it? Palm trees paint the path along the Atlantic shore. A fruit and vegetable stand, one of the most satisfying sights. Wide open roads invite clarity of mind. Benin has pretty good roads extending throughout the country. But you must always, always watch out for the goats! A breath of fresh air– and sand. I think you dropped one? Fresh fruit and happiness brought to you by roadside stands since….well, forever? People meander the alleys in Cotonou. Why wear pants when you can run better without them? Love and peace from Benin. I glance at my watch. Eleven o’clock. I rub my eyes, aware that my hands are far from clean. Dried sweat and grimy hand sanitizer cling shamelessly to my knuckles and nails. But I couldn’t care less. Twenty feet in front of me over two hundred people wait patiently, both anxious and eager to be seen by a nurse. Some arrived last night, determined to make the appointment on time so they slept on the hospital compound. Others come today for their screening appointments with Mercy Ships. Either way, today is the first day that these potential patients will meet a crew member. Expectations are high. Dusk falls as patients wait outside the hospital compound the night before the screening. Dassa, Benin. Last September twelve referral day crew (local translators hired by Mercy Ships) traveled north from Cotonou to register people who live in the bush, far from blood pressure cuffs and scalpels. The day crew sent us (screening nurses) patient information via phone and instructed the people to come today. Early this morning we reminded our patients that these appointments are not for surgery but only for screening. The surgeons are not here today, and they need to see the patients themselves before a final decision is made. Still, people come expecting surgery today because hope is unyielding. Our hopes are also high; however, some of the patients we preregistered are not good candidates for surgery. My team approved appointments based on demographics, minimal medical information, and photos. As my dad would say, “For every one thing you miss for not knowing, you miss ten for not looking.” He’s right. A face-to-face visit with a patient reveals far more information than what is transmitted over a phone (singles, remember that for dating. It applies there, too). Infrequent glances at the crowd inform me that we have a long day ahead of us. I watch the jagged line shift as patients inch their way towards me. December does not equal cold weather in Dassa, Benin. It’s quite warm despite the overcast morning. We are nestled within the hospital compound. When I say “nestled” I actually mean crammed along a covered path attached to the hospital building. Mel, Rachel, and I set up our screening stations in close proximity to Ria, the surgeon screening coordinator. As the patients queue to the nurses, crew members measure their temperatures and take their weights. Rachel, Mel and I assess potential patients. If they are good surgical candidates we forward them to Ria, who schedules an appointment for the patients to come to the ship for diagnostics or a surgeon screening. Rachel measures the diameter of a facial tumor. Eleven o’clock. I shift in my chair and focus again on the patient in front of me. Samuel, my translator, tells me that she takes no medications from the pharmacy or market. No herbs or leaves or roots. “Okay,” I respond, “You can wait at the end of the building to see Ria, a nurse who will give you an appointment for consultation at the ship.” I smile at the patient. Her smile consumes her face; her eyes disappear. I motion the next patient to come. I can’t help but notice the messy clothing sagging from his limbs. The fabric seems to be too heavy for his frail body. He approaches me calmly. Samuel, my translator, tells me the patient has come for a hernia. There isn’t time for formalities so we get right down to business. We return to our seats. Something seems off. The patient is wearing a winter hat over his head. That’s pretty full on, I think to myself. We’re in West Africa. Winter hats are not necessary. The man catches me staring at him. He points to the back of his head and quickly removes his hat. My eyes widen. At the nape of his neck lies a softball-sized tumor, weeping and open-sored. I exhale, my breath saturated with disappointment. This mass is slowly murdering him. I can’t form words. Instead, I continue my exam. His eyelids are more pale than my yovo (“white person”) skin. He reports ongoing nausea and fatigue since the tumor started growing less than a year ago. He is unable to work as much as he used to because he feels ill. I skim the screening sheet. He is only twenty-nine. I know what to do, but my heart stutters. I need a team member’s agreement, so I ask Mel to come. She confirms my assessment. “There’s a high probability of malignancy,” she says sadly. I look at Samuel. He is doing an amazing job. Samuel nods. He pauses, contemplating, then begins to speak in the man’s local language. I feel frustrated that I cannot communicate directly with my patients. I would love to know what they actually think about the situation. But, simultaneously, I love working with translators like Samuel. I trust him to deliver the news in a culturally appropriate manner. He is sensitive and respectful to the patients. The man listens quietly, expressionless. After, I invite him to ask questions. He inquires once more about the hernia surgery. I swallow. 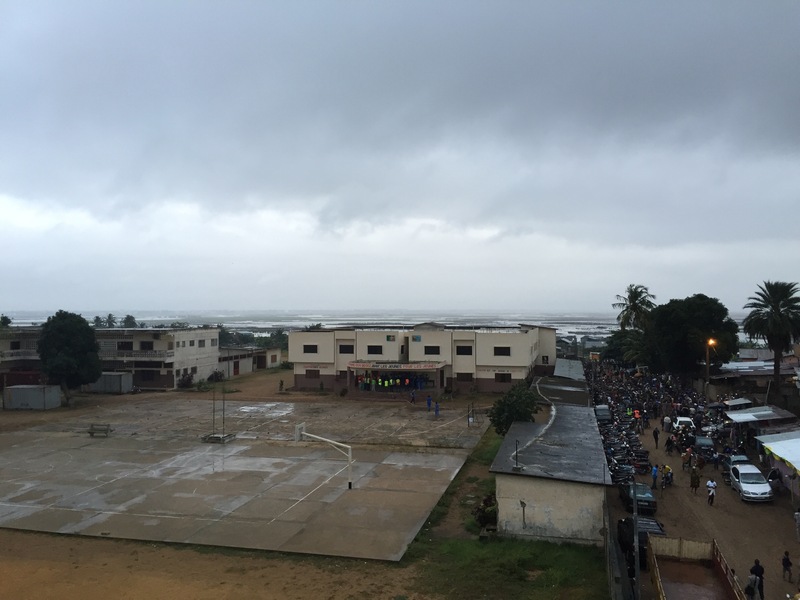 “It is not possible for Mercy Ships,” I answer. The man looks at the ground. Then, rather suddenly, he thanks us, gets up from his chair and walks to the exit of the compound. I motion the next patient over, and we begin again. The day is taxing for the team. We turn away many patients who are too sick to have surgery, but who also have little hope for treatment. Children with ascites, aggressive spinal tumors, and rare genetic disorders that surgery will not improve. Adults with hypertension, diabetes, anemia, and oozing wounds. These problems are only a small representation of the conditions we see. At some point during the day each of us takes a moment. “I need a minute” is a common phrase we use. My teammates are strong but also very human. We feel the patients’ emotions and reactions. Processing and debriefing with each other is a crucial aspect of screening. Come to think of it, I think that’s what this year is for me: constant processing. Every day I witness the plights of the poor. I talk with those who have been abandoned, neglected, and forsaken. I discuss ethical problems and am forced to make decisions that usually don’t feel good. Over time, that weighs on a person. I don’t want to recover either. Right now I wouldn’t trade this job, one teeming with raw human suffering, for anything. I will always remember these delicate stories. They hold me accountable to live responsibly, walk humbly, and pray constantly. Screening day preparation includes sorting through patient lists, transcribing information, and organizing transportation lists. Natitingou, Benin. Screening + Security teams in Dassa. Stunners. Our eyes meet. I glance at the four-year-old twins next to him, both struggling to balance on extremely bowed legs. I try to hide my expression from their father, fearing my transparency will only make the situation worse. “Please. You can help us?” His words feel like fire. I apologize again. The response doesn’t feel natural at all, but thick and poisonous. My explanation regarding a full orthopedic program cannot dissipate his tangible sadness. Or his continued questions. My mind knows the answer is still “no” but my heart cannot support it. I need back up. Nate’s gaze falls on the young girls. “Technically, we can’t,” he says softly. I turn back to three pairs of desperate eyes. Feigning confidence, I repeat that the program is full. The father is staring at me. Finally, with a quick nod he motions his family off the cement slab and toward the exit gate. I watch the man shuffle through shifty sand, trying to support his twin daughters. My heart breaks. I feel like a liar. Our orthopedic program isn’t full. As a screening team we had decided to allocate the sixty one orthopedic surgery slots. We divided the slots among three weeks, which is how long the screening center is open. The alternative was to take all sixty one patients as they come. First come, first serve. If we had chosen this option our slots would have filled in about three days’ time. Some team members thought it would be fair to offer surgical opportunities to patients who will journey to Cotonou over the next two weeks. We agreed that we would attempt this approach. This meant that we would take only ten more orthopedic patients this week. We had already found those ten. I had thought we made a sound decision. After all, I had turned countless patients away this week. This is difficult; however, “no” is more straightforward and undemanding when the patient doesn’t meet surgical critera. I feel okay when I can shunt the control elsewhere because the disappointment is not my fault. You’re too young to have the surgery. Mercy Ships only offers this to women who are past child-bearing age. Or I’m sorry, but Mercy Ships does not do this kind of surgery. Or unfortunately, surgery could make the problem worse. These conversations are certainly sad, but they’re doable. This “no” felt completely different. Gone were the external factors. I had no organizational chart to fall back on, no exclusion critera to support my verdict. These Nigerian twins met the requirements for surgery, but there is an overwhelming demand so we had to pick and choose. Our selection system seemed ungrounded and unstable. I don’t even want to make life-changing decisions for myself. How can I make them for other people? When the decision is mine (or ours, as a team) the responsibility feels sovereign. The power is dreadful and condemning. I feel like I am playing God. Speaking of God, I am not sure what Jesus would do in this situation. He faced desperate eyes and crippling ailments. I am willing to bet that he felt overwhelmed. Even though his divine nature had no healing limitations or surgical quotas, I am convinced that as a man he felt aching disappointment and deep discouragement in every breath he took. I watch the twins approach the exit gate. I want to scream, Come back next week! We have more slots! But what if they are too late? What if they can’t make it through the gate? What if they are the ninth and tenth orthopedic patients in line, and are denied again because we accept the first seven? I turn back to the weaving line of people, some of them soon-to-be patients. The queue seems more like a maze of fraught individuals eager to come out at the right end. I signal the next man to approach me. Now I understand what Jesus would do. He would keep meeting with those who are suffering. He would come back to this cement slab every day. He would remain open and continue to offer his heart to the wounded, broken, and downtrodden. Just because you can’t help everyone does not mean that you don’t try to help anyone. 0700 at the screening center. outside the gate nearly a thousand people gather every day . Disclaimer: This is a personal and private page about my experience aboard. This is not an official Mercy Ships page. The reviews and statements presented here may not reflect the beliefs of the organization.